This is where any posts about Ludum Dare or Ludum Dare games made by Frog Rock will go. 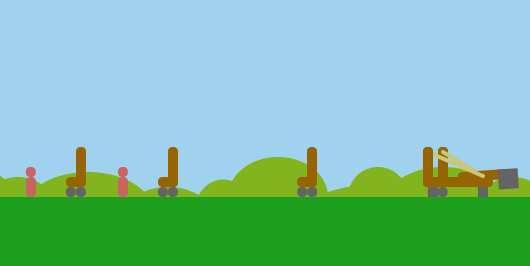 Crazy Catapult, a Ludum Dare 36 submission. Welcome! I figured that it’s about time we make one of these. With Ludum Dare 38 coming up, I’m going to give you the rundown of what Frog Rock has done in past Ludum Dares and what our goals are for this time around. In Ludum Dare 33, Frog Rock was still a solo production, run by me. I was still learning the ropes of game making, and up until a few weeks beforehand, I had no idea what a game jam actually was. I did little planning or advanced brainstorming before the jam, so my game idea wasn’t the best. I was on vacation during the second half of the event, so I completed my coding in the Minneapolis Airport. I didn’t place well in the competition, but I still had a good time and learned a lot. By Ludum Dare 36, I was prepared for the competition. I spent the whole weekend programming, and I already had an idea in mind. The graphics, feel and gameplay all worked well in unison. LD36 was not judged, but I feel that my game did the best that a submission of mine ever has in a Dare. During LD37, I tried something new. I used Love2D instead of Khan Academy. The problem was, I hadn’t done much more than experiments with Lua. The Love2D framework was new to me, and I ended up doing graphics on Khan Academy. I made the whole game in black and white, to evoke a retro feel, but I didn’t use pixel graphics for some reason, probably because I don’t like them too much. The game did better than Bit by Bit, my LD34 entry, but I still think that I could have done better. This time around, I’m probably going to use the Khan Academy engine once again, unless I decide that Love2D would be more convenient. I’m going to emphasize the feel of the game, and I am going to plan my artwork accordingly. I will post here again when I am done. Until then, click here to visit the competition website and watch on as thousands of other game developers test their luck.